Alongside this, the Ladder Association has followed up another record breaking year for its training scheme by branching its seminars out internationally for the first time – the latest sign that ladder use and safety is being viewed more and more seriously around the world. One of these seminars has already seen the Association reveal for the first time that it has entered into an agreement with a government outside of the UK. With this kind of new international development taking place, more changes are expected later in the year which could affect the way ladders are used in the workplace beyond even the new HSE guidance. This year the HSE launched two new pieces of guidance to tackle work at height legislation. INDG401 was created to act as a brief guide to general work at height, but alongside it was the more specifically focused ‘INDG455: Safe use of ladders and stepladders – A brief guide’. The new seven page document is devoted to summarising the “simple, sensible precautions” that ladder users and their employers need to know about. INDG455 was created with the input of the Ladder Association, alongside consultation with the Access Industry Forum, the British Retail Consortium and the Small Business Trade Association Forum. It was created as a response to feedback that the work at height regulations were fit for purpose without the need for any changes, and that where problems existed, they arose from the misinterpretation of the regulations rather than from the regulations themselves. It is not hard to find examples of misinterpretation arising from the regulations. Over the last two years the HSE’s ‘Myth Busters Challenge Panel’ has taken on more than 260 cases where overzealous decisions were made in the name of ‘health and safety’, and a number of these have related to work at height. In recent years the Ladder Association has found itself battling with these myths, at one point adopting the slogan “Ladders are not banned,” as the rumour that ladders should never be used in the workplace began to spread. Having spent so long correcting this, the Ladder Association was quick to welcome the HSE’s move to simplify and clarify its guidance while leaving the regulations themselves unchanged. In a statement released when the new guidance was launched, the Ladder Association said: “Ladders are a versatile and invaluable piece of workplace equipment but, like all other forms of access equipment, there are some common sense rules for using them safely. It’s all about sensible and proportionate management of the risks. “Fortunately, we now have some straightforward, easy to understand guidance from the HSE that confirms and reinforces this message and, at the same time, provides advice on the often simple, but sensible, precautions that those using ladders and step ladders should take to keep safe and avoid falls from height. The main issues in deciding when a ladder can be used are the risk and duration. The ‘short duration’ guideline typically means that ladders can be a good choice if no one is expected to be on them for more than half an hour at a time. Being used for longer is one of the most important indicators that a ladder might not be the best option. Next the guidance explains when ladders should be inspected. It focuses on pre-use checks, which should be carried out by the user at the start of the working day, or after a change like the ladder being dropped or moved from a dirty area to a clean one. These inspections involve checking the stiles, feet, rungs, locking mechanisms and steps, while for stepladders the platform and treads also have to be checked. A more detailed explanation of how to inspect a ladder is available as a free Toolbox Talk from the Ladder Association’s website. The guidance then goes on in bullet point form to list a range of simple precautions for both ladders and stepladders that minimise the risk of falling. These include avoiding overreaching or overloading with equipment or materials, using the one-in-four rule so that a leaning ladder is, for example, one metre out from a wall for every four up, and maintaining three points of contact when climbing and wherever possible while working. After these tips, the next issue singled out in the guidance is securing ladders. Various options are given. If possible, the ladder should be tied with both stiles to a suitable point, but if this is not practical it can be secured with an effective stability device. If this is not possible either, it should be securely wedged against something; for example, a wall. If none of these options are practical, the ladder should be footed by another worker, although this is a last resort which should only be carried out after other forms of access are considered. Towards the end of the document, a section on ladders used for access gives advice on how these should be used. The guidance here explains that ladders used for access should be tied and that a self-closing gate is recommended for them, but it emphasises that stepladders not specially designed for the purpose should not be used to access another level. One final section reiterates the need to check the ladder’s condition, going into more detail on what to look for. This section emphasises that a detailed visual inspection is “similar” to the simple pre-use check previously explained. Both are used for the same purpose – “to spot defects.” These inspections can be carried out in house – anyone trained to use a ladder should learn how to carry out a check in the course of the training. Early in the document, one vital issue is mentioned under the heading “Who can use a ladder at work?” This explains how the law requires that “to use a ladder you need to be competent.” A competent person in this case is defined as someone who has had instruction and who has an understanding of how to use the equipment safely. The guidance notes that “appropriate training can help.” Competence comes in three parts – having sufficient skills, knowledge, and experience – and as training ensures that at the very least the trained person has the required skills and knowledge, it is generally looked for to help prove this competence in the workplace. Further information about the HSE’s new guidance can be found on the Ladder Association website, along with other detailed guidance and information on related issues. A range of work at height information and details on UK regulations is also available from the HSE itself (www.hse.gov.uk), including this year’s two new documents themselves, which also come with links to further reading and information should any more detail be required. Guidance for ladders was needed in the UK because of the myths and confusion that had grown over the years, but so far 2014 has also been notable for proving that ladder safety is being taken seriously in a wide range of countries. In April of this year, a new study in the United States, published by the US Centers for Disease Control and Prevention’s ‘Morbidity and Mortality Weekly Report’, put ladder safety squarely on the American agenda. The study found that ladder falls were one of the chief contributors to falls from height. As in the UK, falls are a leading cause of deaths and injuries in the United States, and the study found that a remarkable “43 percent of fatal falls in the last decade have involved a ladder.” Among workers, it was found that around 20 percent of injuries from falls involved ladders. 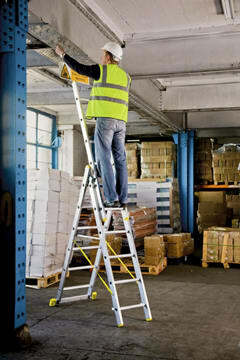 Given that ladders are recommended for use in low risk tasks, the number of falls which led to a death is particularly high. Echoing the HSE’s and the Ladder Association’s messages, though, the study did not blame the ladders themselves for these figures. Rather, it listed the ways in which many of the injuries and deaths could have been prevented. International developments this year have also come from the UAE and South Africa, where the Ladder Association took part in events for the first time. At the FM Expo 2014 in Dubai, which was held from May 19 to 21, it was revealed that the UAE’s Ministry of Labour had signed a Certificate of Recognition declaring that the Ladder Association could carry out occupational safety training in the Emirates. This marked the first time the Association had shown an interest in expanding outside of the UK. The decision came due to the need for this type of training in the region, and the Ministry of Labour’s involvement in the agreement emphasised that ladder safety is being taken seriously there. With this agreement in place, the Association is free to begin the process of enlisting members to carry out training, but its plans are yet to be outlined. This ground breaking news was followed a month later by the OSH EXPO Africa 2014, a conference held from June 13 to 15 in South Africa, which involved the ‘PASMA & IWH Working at Height Theatre’. OSH included seminars from the Ladder Association looking at case studies of ladder falls and safe working at height. It marked another first, with the Association having never before taken part in an event in the region. Again, this came as a response to the need for the subject to be addressed there. With this year also seeing European rules on ladders being looked at, by the end of 2014 the year seems likely to be remembered as one of major changes in the field globally. The number of people trained by the Ladder Association has been rising steeply for years now, culminating in a 40 percent jump between 2012 and 2013’s final figures, and these international developments make it clear that the rising focus on ladder safety is set to continue.